The Asics Gel Sonoma 3 looked visually appealing, a number of consumers noted. Several testers commented that the general durability of this iteration was worthy of their trust. There were reviewers who thought that it had an affordable price. This version felt more comfortable than the previous one, stated several purchasers. Those with wider feet were happy that this shoe was available in a wide width variety. Many consumers were able to wear it on various surfaces—even on the roads—and they reported no problems during the experience. A runner praised the outsole unit of the Gel Sonoma 3, stating that it gave reliable traction. This shoe ran true-to-size, reported some satisfied testers. A runner complained that the sides of the collar tended to rub against the back of the Achilles tendon, causing some discomfort. For a disgruntled consumer, this shoe was a ½ size bigger than what he was used to. The forefoot section was a bit narrow for some testers; they felt the upper fabric rub against their toes. A purchaser reported that the laces tended to loosen up and that they didn’t stay tight during the running session. 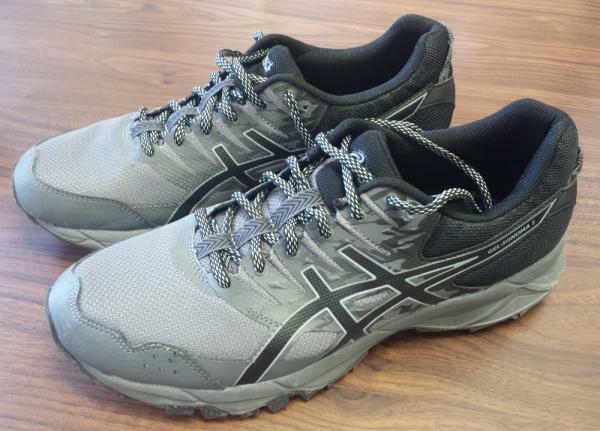 Many of those who have tried out the Asics Gel Sonoma 3 were satisfied with its performance. For them, this neutral trail running shoe was able to give them comfort in a durable and versatile package. Some even thought that it was a step up over the previous version. Conversely, there were a few runners who complained about the fit and the sizing scheme. As far as sizing goes, the Asics Gel Sonoma 3 is spot on. In addition to correct sizing, these fit well! Every part of the shoe is comfortably just a little snug without being restrictive or tight in any way. Some runners might prefer a wider toe box than this shoe offers (I don’t). My feet also run slightly on the narrow side, so a handful of runners would prefer this shoe be wider. Fortunately, this shoe is also available in a larger width. Virtually any runner should be able to find a good fit with this shoe. I have to take a few points off for one small problem - there’s some stitching on the inside of the shoe that rubs against my left pinky toe. I almost never blister, but this managed to do it. Not sure why my left toe only - my feet are the same size, so perhaps I run slightly asymmetrically. This may not be an issue for some runners, just as it’s not an issue for my right toe. But I have to grade based on my experience. I’ve done a little surgery on the shoe and removed only a few stitches, then reinforced the area with super glue. It’s an improvement, but the seam is still there, so I have to wear a small band-aid when running. Kind of a nuisance, but cheaper than ditching a perfectly good pair of shoes and buying new ones. Parts of the upper feel a little stiff, particularly around the heel. This makes it somewhat difficult to put the shoes on, but after only a few runs, it got a little better. The upper isn’t as breathable as some others, but I’ve also seen worse. If you’ve run in any waterproof/“breathable” shoes before, it’s at least better than that. This may not be an issue depending on where you live, but I live in Texas. On top of that, I tend to wear my thicker socks because of the pinky toe issue, making a warm shoe even warmer. Fortunately, I got these shoes in December, so a large portion of its lifespan will be used up before it gets warm again. The shoelaces...this is a bust. They’re bulky and they come untied easily. Once my old shoes are officially retired, I’m recycling their laces. I, for one, like the understated tread of this shoe. The lugs aren’t deep enough for especially muddy conditions, and it also probably isn’t the best for the most difficult technical terrain. But what if your daily run doesn’t involve mudholes and technical climbs? If you’re looking to hit the trail in your local park, this is your shoe. The tread pattern provides plenty of traction without overdoing it. In addition, it performs decently well on pavement without feeling like a tank. In short, this is an excellent door-to-trail trainer. For a trainer, I find the Sonoma 3 to have just the right amount of cushion. Slightly above an average amount, enough that you could train double-digit miles on a daily basis, but not so much you feel like you’re running in sand. Once you get off-road and onto a soft surface, the cushioning feels great. Recently, some manufacturers have been experimenting with different foams and gels, giving their shoes more bounce and adding an extra spring to your step. These don’t do that. Asics refers to the foam as “SPEVAFOAM” and the gel as “Rearfoot Gel”, evidently proprietary technologies, but I haven’t found them to feel anything more than standard. That’s not necessarily a bad thing; you simply shouldn’t expect these shoes to be “special” in any way. They do their job and do it well. Like the upper, the ride is somewhat stiff on its first run but loosens up slightly after a break-in period. These aren’t racing shoes, so they’re not going to be particularly flexible or responsive. I’d like them to be a little less stiff, but many runners might appreciate it. Asics recommends this shoe for either neutral runners or those who under pronate. I overpronate slightly, but find this shoe to work just fine for me, as most neutral shoes do. The ride is mostly neutral, with a little bit of general support and stability. Again, these are ideal for use as an everyday trainer. Dang cool, in my opinion. The Gel Sonoma 3 manages to look rugged while also looking like they could move fast. I normally hate camo, but this subtle version of it looks great! And, thank goodness, the outsole is black. Anything but a dark-colored outsole is a bad idea, especially for a trail shoe. A white one is idiotic. Overall, the Asics Gel Sonoma 3 is an excellent everyday trainer, especially as a door-to-trail shoe. Most of my daily runs are half on the pavement, half on the trail, so this is exactly what I was looking for. It’s a little heavy, but I prefer my trainers a little heavy. Heavy shoes make you stronger, and when you lace up something speedier on race day, you’re bound to have a good race. Also worth mentioning, this is the only running shoe I’ve ever had where the actual weight was less than the advertised weight. I’d like to score this one higher, but the pinky toe blister issue prevents me from doing so. If other people don’t have the same issue, I’m sure these will get deservedly higher marks on average. The Asics Gel Sonoma 3 is an update to a series of trail running shoes that’s created for those who have neutral foot pronation. It features colorful designs that are not distracting. It also doesn’t have a bulky façade, which is common among most trail running options. The upper unit of this running companion makes use of a durable mesh material. It covers the foot and protects it from rocks and other debris. Synthetic materials reinforce this section of the upper. There’s some stitching involved, but the mid-foot area’s overlays are fused directly with the main mesh material. A responsive yet durable compound is used for the full-length mid-sole platform of the Asics Gel Sonoma 3. It is capable of carrying the foot responsibly throughout the running session, yet it doesn’t break down easily. As with most of Asics’ offerings, the Gel® Cushioning System graces this model. It’s responsible for providing impact protection during the landing phase. The proprietary rubber compound of Asics is used in the outsole of this trail shoe. It prevents the abrasive nature of the trails from causing any damage to the mid-sole foam material. Multi-directional gripping lugs ensure traction over a variety of surfaces, making upward and downward traversals much easier. The Asics Gel Sonoma 3 has a standard sizing scheme. It adheres to the regular preferences of runners. The available widths for the women’s version are B – Medium, D – Wide, while it’s D – Medium and 2E – Wide for the men’s version. The semi-curved shape of this running shoe allows the natural curve of the human foot to fit into it with ease. The outsole unit of the Asics Gel Sonoma 3 features the AHAR® or the Asics High Abrasion Rubber. It covers the entire mid-sole foam unit and protects it from wear and tear. A Trail Specific design has been employed in this section of the running shoe. Gripping lugs are present and they face multiple directions. They enhance surface traction by acting as clamps that grip the ground with sureness and ease. The SpEVA® is a high-quality foam unit that runs the entire length of the Asics Gel Sonoma 3. It provides responsive cushioning to the foot of the wearer. Its durable construction allows it to last long and not break down, even after many uses. The Gel® Cushioning System is placed in the rear section of the platform. This silicon-based unit attenuates shock and ushers the foot towards a smooth toe-off. The Gel cushionin gis present in many other running shoes of Asics, one of which is the Gel Nimbus 21. A sock liner provides additional cushioning and support. It’s molded to mimic the curves of the underfoot, therefore giving a bit of comfort to the arch, which isn’t usually addressed in neutral shoes. A durable mesh material is used for the upper unit of the Asics Gel Sonoma 3. It protects the foot and wraps it in a secure way. It’s also breathable, so it is able to keep the runner well-ventilated throughout the activity. Synthetic overlays are added to the façade. Some stitched sections are present, particularly in the rear section. But the mid-foot area’s overlays are fused directly to the fabrics. They help in giving more form and structure to the shoe. They also make the coverage as snug and secure as possible. A breathable fabric lining ensures a comfortable in-shoe feel. It’s soft and agreeable to the skin. It even maintains ventilation, which is helpful in keeping the foot cool and dry. The padded tongue and collar give cushioning to the upper dimensions of the foot. They also prevent unintentional shoe-removals by keeping the foot in place.